How many times has your kiddo asked for a cellphone? Probably more than you can count, right? Why haven't you gotten them one - is it because they're too young, or not responsible enough and maybe, like most of us, you don't want a billion dollar cellphone bill after the very first month - right? Have you checked out Kajeet cellphones? They're designed especially for the younger members of your household and they have some great special features that will not only make your kiddos happy - they're kind to your wallet as well. Kajeet has a special feature that lets you and your child decide how the cost of the phone is divvied up. Maybe you have a teenager and they agree to pay $25 of the bill every month while you make up the rest - Kajeet has a special feature to help them learn the responsibility of paying their own way. ~ YOU set the limits for calls and texting - once they've used their limit, they'll just have to wait until next month. Kiddos will learn to ration their allotment. ~ You control the times they're allowed to use the phone. ~ You control who your child received call and texts from. ~ Never worry about a lost phone. Locate your kid's phone anytime and even set automatic check-ins with GPS Phone Locator. ~ Plus Kajeet Phones have all the great features your kids want like talk, text, pix and play. Now there's no reason not go let your child have the security of being able to reach you whenever they need you - whether it's at soccer practice or the mall, they'll always be in touch. 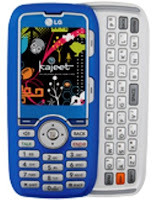 As one of our Grand Prizes, we have one Kajeet Blue QWERTY cellphone to give away to one (1) lucky reader. *Pop on over to Kajeet and see just how they can help you give your child the phone they want while keeping control over how they use it. Then come back and leave us a comment about your favorite feature that Kajeet cellphones offer. This contest ends Monday, June 15th at 11:59pm (pdst) so don't wait - make sure you've gotten all seven entries before it's too late! Please note: entries received after the cutoff time will be deleted prior to drawing a winner. My favorite feature of kajeet is that you can locate your kid's phone anytime and even set up automatic check-ins with the GPS Phone Locator. They can run but they can't hide! I like that you can set up hours as to when the phone can be used based upon who is calling hte phone! I also like the GPS feature, provides peace of mind! My 9 year old son has been begging us for a phone for quite awhile now. This is the perfect phone for him. The feature that I love best is that you can Create separate allowances to decide who pays for what, you or your kid with WalletManager. Thereby helping to control the monthly costs. What a wonderful idea! Thanks for offering this great giveaway. I have been thinking about getting one of these for my daughter. This is perfect for grade school kids, they get to have their cell phone but not drive mom and dad bankrupt! I love the GPS locator for safety reasons. Thanks. I like the control of time usage and internet access which is basically a monetary allowance control (much like life for us adults...). I love that it set limits for calls + text. I so love the GPS Phone Locator feature, thanks! Oh. They've made my choice sooooo easy. The GPS phone locater. YES!!! GPS? A locator? Parent heaven. I love the fact that they have a GPS phone locator. I really like the parental controls. That would be most important for me. Thank you! I like that parents can control whom the child can receive calls from. Awesome! I really need a new phone. I just have a plain jane basic phone and my kids keep telling me how out of style I am. I would love to win this so I can show them that mom is hip now!! HEHE! Thanks! I love that the plans are as low as $4.99 a month! I like Our parental controls allow you to set up allowances, decide who she can call and text, and when. Decide together when the phone can and can't be used with TimeManager. The GPS feature would be a God send. The ability to locate your child at any time, I am thinking emergency now, would be incredible. They have som e really inexpensive plans. 4.99 per month to start. that's great. I think my favorite aspect of the Kajeet plan is their very reasonable cost for someone who doesn't use the phone very much. I have one grandson, who carries the phone only because we insist that he have some communication method. Even as an adult, something like this would be perfect for him. I like that they can always call parents and 911. And the GPS locator! I like that you can set limits on texting. Online parental control is a great tool. Thanks for the chance. I like that you can locate your kid's phone anytime and even set automatic check-ins with GPS Phone Locator. I followed you on twitter (ccswch). my favorite feature is the time manager. I love that they offer GPS location! Very useful for this careful mama! I like the time allotment feature. When they run out, they run out. That is terrific because I have a 16-yr. old who could really benefit from learning restraint. Facebook fan (Missy Jones). Thank you! I love how you can locate your kid by where their phone is at using the gps navigator! neat! This is great. I have a 12yr old son that this phone would be perfect for. I love the built in GPS & MP3 player. With summer coming up he is going to want to be out riding bikes & hanging out with friends. This phone is a great way for him to check in without breaking the bank. I love the Contact Manager feature that lets you Accept the calls and texts you want and block the ones you don't! Follow you on Twitter her5boys! I would love to have for my daughter. I love the GPS phone locater-perfect for scatterbrains like me! I follow on Blogger (ptowngirl). I love the GPS & MP3 on this phone. I like the GPS and Wallet Manager. I love that you can get online and control your kids limits including the calls and texts you want to accept or block! My son has been begging for a cell phone (he's 10) and this looks perfect! I think the GPS phone locater is the coolest feature! It would be great to be able to see where my son is, if he isn't answering for some reason. i would like this for my grandaughter. This phone is such a great idea for the worried parents in all of us! The best feature for me of course being able to find my kid's phone all the time. omg. a gps tracker! i love it!! I love that it has a time manager for when the cell phone can or can't be used! Without a doubt the best feature, to me, is the GPS locator system. Hi! I became a fan on facebook! My Facebook name is Michele Obrotka Bach. The Gps locator is the best function these days. I would love this for my son! I think it is great that it has a GPS locator. Would be perfect as a first phone for my son. Thanks for the giveaway. My favorite feature is that there's no contract! Thanks for the giveaway! My favorite feature of kajeet is that you can locate your kid's phone anytime, so cool. My favorite feature is DEFINITELY the GPS! It's comforting to know it has the GPS. Love that they have a built in GPS locater! i love the built in GPS locator - fabulous feature! no contract, no early termination fees, no activation fee, parental controls, AND GPS locator?! What is there to NOT like about this phone!!?! I like the GPS feature and the parental controls! My favorite feature is the GPS. i would love to have this for my grandaughter....great ideal setting the hours it can be used! I love how we can control the time that they will be on the phone because my daughter will talk for hours, if I let her! I love love love the feature that you can locate your child's phone at any time. Thanks for the giveaway! I like the GPS function. I like GPS phone tracker. The GPS / Tracker is what "sells" the phone to me for the kids. I like the GPS phone location that way I know my child is where he said he is. I like the GPS feature the best. I like that they have no contracts or activation fees. My favorite features that Kajeet cellphones offers is that I can control who my child is communicating with whether it is through phone calls or texting. I want to teach our son responsibility and provide him with a sense of security by having a cell phone, and it will give me a great sense of peace of mind in knowing I can control who he talks to and the times that he is allowed to use the cellphone. This is parents dream come true! Thank you so much for the chance to enter. I became a member of your social network today. GPS is the beat feature I like. I really like the GPS locator feature of the phone. Thanks for the giveaway! My favorite feature is the parental controls. What a relief!!! Thank you for the opportunity to participate in this giveaway! the gps locator sold me for sure! I love the thought of tracking the phone by GPS. It might be useful for tracking my daughter, but she loses things so often it'd be more valuable for finding a lost phone.